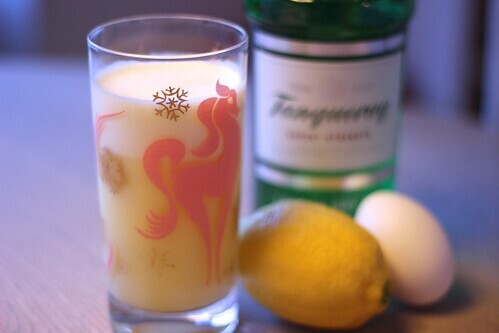 The Golden Fizz is essentially a Gin Fizz with an egg yolk in it. Just to be complete on the standard fizzes with egg, a Silver Fizz uses egg white instead of yolk, and a Royal Fizz uses a whole egg. The Savoy has 27 fizz recipes, all with little variations on the standard. Some swap out the main spirit, while others add another element, like an egg, liqueur, or other flavor. I can see myself exploring all of the Savoy fizzes sometime soon. Out of all of these though, I love cocktails with egg (I’m a huge flip fan) so this is definitely right up my alley. Again, the differences in the recipes is about the sweet/tart balance. It’s interesting that Axel’s recipe is less sweet in this instance, since generally his are sweeter. I prefer this with the heavier sugar that Café Royal calls for. A fine, tasty drink.